In spite of your Muslim ex-president Barrack Hussein Obama’s fake Hadith type treaty with Iran, their nuclear missile program to annihilate Israel and the free world continues business as usual. I challenge you to read the Islamic rules of engagement in their books, the Quran, the Hadith, and the Sunnah. These are the Muslim manuals and rules of Jihadi war against the world of infidels. “Iran’s provocative Friday test-firing of a new ballistic missile capable of striking Israel with nuclear warheads threatens the free world,” Israeli Defense Minister Avigdor Liberman said on Saturday. on Friday, Iran test-fired the new long range Khorramshahr missile capable of carrying multiple warheads a distance of more than 1,250 miles. This puts Israel, Saudi Arabia, India, and much of Eastern Europe within striking distance of Iran. 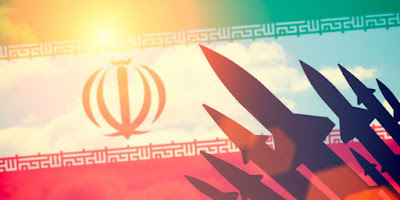 The test violated Obamas so-called Iranian treaty as well as Iran’s agreements with the UN as expressed in the UN resolution 2231 which forbids Iran from testing missiles capable of carrying nuclear warheads. And contrary to what Muslim apologist Secretary of State Rex Tillerson says, that Iran is technically abiding by the agreement, the truth is that Iran has violated these agreements several times in the past resulting in U.S. economic sanctions against companies involved in the Iranian missile program. Iran of course denies its missile development breaches the resolution and says its missiles are for defensive purposes only and are not designed to carry nuclear weapons. I have been writing and warning about this since June of 2015. Read a few of the articles I published about this issue. On October 15, U.S. President Donald Trump will have to decide if Iran is complying with the agreement put in place by former President Barack Obama called the Joint Comprehensive Plan of Action concerning the Iranian nuclear program. If he does not certify Iranian compliance, Congress will have 60 days to decide whether to re-impose sanctions waived under the deal. Britain, France, Germany, China, Russia and the European Union also ignorantly signed on to the nuclear deal, and their leaders have all announced publicly that they want the agreement with Iran to continue without sanctions. The International Atomic Energy Agency, the Islamic controlled UN watchdog agency responsible for verifying compliance, has of course repeatedly confirmed Tehran is meeting its commitments. THE BOTTOM LINE: Iran is an Islamic State and if one knows Islam, one will know that a treaty, covenant, or any kind of agreement with a Muslim is null and void right from the get go. The lesson of treaties is found in the Hadiths of Muhammad, in an example of Muhammad’s infamous treaty with the Meccans after an Islamic attack on the City State of Mecca ended in a stalemate. A 10 year treaty between Muhammad and the government of Mecca, just as Obamas 10 year treaty with Iran, was agreed to. Only 2 years later, after he built up his military, Muhammad again attacked Mecca and the rest is history. Islamic treaties mean nothing but buying time to strengthen their ability to break the treaty, and are strong enough to continue their Islamic Jihad against the infidel. Your ex-Muslim president Barrack Hussein Obammah absolutely understood this, just as the Iranians did, they were both following the teachings of Muhammad. Make a fake treaty and the ignorant infidel will be fooled once again.